As a recent comedy goes, Keanu is above average and works on many levels. The story was cute and the cat(s) even cuter – not to mention pretty good at acting. Key and Peele have been a successful comedy duo for many years, so it seemed like a no-brainer for them to star in their own comedic movie together. Written by Peele (MADtv), along with Aex Ruben (Community), Keanu premiered in Theaters on April 29th this year and garnered a certain amount of critical praise. The movie is hitting stores this week on Blu-ray hoping to capitalize on the following it had. Clarence (Keegan-Michael Key; Tomorrowland) is a hard working suburban dad who clearly loves his wife and daughter, but who never does anything adventurous in life. His cousin, Rell (Jordan Peele; Bob's Burgers), is a marijuana smoking "artistic" type whose girlfriend just broke up with him. He is depressed and unmotivated until a stray kitten he names Keanu shows up at his door. Unknown to Rell, Keanu was originally owned by a drug dealer and is taken by two drug dealing killers dubbed "the Allentown Brothers", and then ends up with a third dealer named Cheddar (Method Man; Trainwreck). In an effort to get Keanu back, Rell and Clarence pretend to be The Allentown Brothers and infiltrate Cheddar's operation. Of course, everything goes wrong and they end up being exposed. The reason this movie works is because of the talented cast and the script. Key and Peele are a great team and they prove it in this film. Their timing and banter together are excellent and they shine in this movie. If I had to pick one of them, I would have to go with Key. He has a certain charisma and mannerisms that just make him likable and funny, but they are both terrific. They are joined by a cast of solid performers, including two fabulous ladies, Nia Long (Third Watch) and Tiffany Haddish (If Loving You is Wrong). Both women prove their comedy chops and hold their own against these talented men. Other notable performances include Darrell Britt-Gibson (You're the Worst), Jason Mitchell (Straight Outta Compton) and Jamar Malachi Neighbors (Lucas Bros Moving Co). Together, these actors provide the canvas for Keanu's funny moments. There are some truly laugh out loud moments in this movie, though I went into it with certain expectations and the movie didn't quite live up to them. There is also a twist in the movie that I figured out early on, so you could say it was definitely predictable. Despite all that, it is good fun. The Blu-ray is presented in 1080p high definition video and DTS-HD Master Audio 5.1, which gives both components a level of quality that is expected. The audio is especially important in order to highlight the soundtrack of both hip hop/rap songs and a litany of George Michael‘s singles from the 1987 album Faith (that create some of the funniest scenes in the film). The music and dialogue mix is very good as well. Unfortunately, the extras are minimal on this release. The deleted scenes don't add anything to the story. 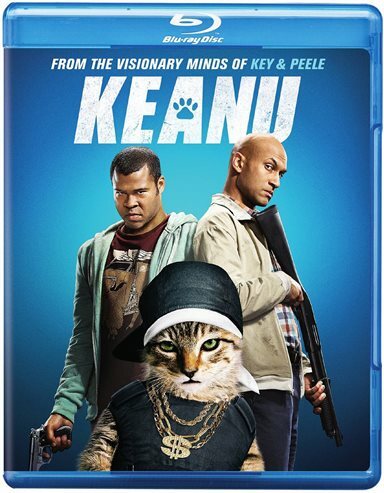 The gag reel is decidedly unfunny, which I must admit was disappointing since I expected a lot from Key and Peele and the feature about the cat (s) playing Keanu was uninteresting and uninspired. As a recent comedy goes, this one is above average and works on many levels. The story was cute and the cat(s) even cuter – not to mention pretty good at acting. For their first feature film starring together, Key and Peele turn in a solid effort and I suspect we will see more from them in the future. It's the type of film you can watch more than once and one you pop in on a lazy Saturday night sitting around the house enjoying a beer or two with friends. I could see this disc being a staple in many homes and expect it will do well in Blu-ray sales. Download Keanu from the iTunes Store in Digial HD. For more information about Keanu visit the FlickDirect Movie Database.